Letter by 24 members of Yeshuot Meshiho to hail Shabtai Tzvi as Messiah. Letter by 24 members of the pious society Yeshuot Meshiho of Amsterdam to hail Shabtai Tzvi as Messiah. In the handwriting of Eliah ben Michael Judah Leon. Amsterdam, 1666. The Yeshuot Meshiho yeshiva was founded in the wake of the mass enthusiasm for Shabtai Tzvi. The members of this yeshiva came from the upper class of the Portuguese community and were for the most part not particularly well-versed on the subject of the Torah. The letter never reached Shabtai Tzvi, probably because the bearers of the letter turned back when they learned of his apostasy. In the same wrap reposes a 19th century copy of 4 ff. 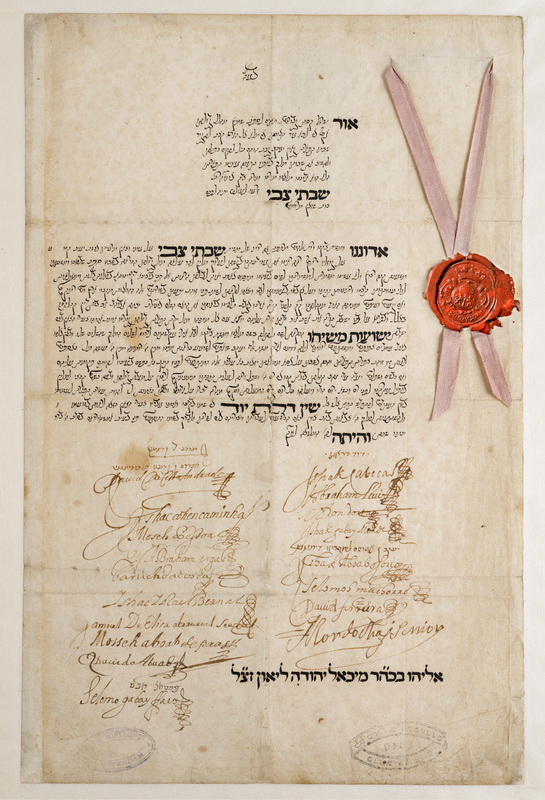 of a sentence of the Amsterdam authorities against Shabtai Raphael, an adherent of Shabtai Tzvi, who was banned from the city October 7th, 1667. Hebrew / Paper / 35,1 x 22,9 cm. / 1 f. (verso blank) / Neat Sephardic, cursive writing with square headings / Sealed with stamp of the Ets Haim Academy.